Opportunity has been silent for months after a global dust storm on Mars. A depressing deadline is nearly upon NASA's long-silent Opportunity Mars rover. The final planned attempts to rouse Opportunity, which hasn't made a peep since last June when it tried to outlast a Martian dust storm, occurred late Tuesday (Feb. 12), NASA officials said. You can watch that event here at Space.com, courtesy of NASA. The golf-cart-size Opportunity landed on Mars in January 2004, a few weeks after its twin, Spirit, touched down in a different part of the planet. Both solar-powered rovers embarked on 90-day surface missions to search for signs of past water activity — and both were incredibly successful. Spirit and Opportunity found lots of evidence that Mars was a relatively warm and wet world billions of years ago, reshaping scientists’ understanding of the planet’s evolution and potential to host life. And the duo just kept rolling along. NASA didn't declare Spirit dead until 2011, and Opportunity was going strong until a monster dust storm rose up around it late last May. The swirling dust blocked sunlight from reaching Opportunity, which fell silent on June 10. Mission team members have been trying to rouse the rover ever since, and they’ve been listening for any possible signals from Opportunity as well. There has been hope that this "active listening" campaign could produce results even after so many months of rover silence. The windy season at Opportunity’s locale — the rim of the 14-mile-wide (22 kilometers) Endeavour Crater — didn’t kick in until November, and mission team members figured they might just need a good gust to blast the dust off Opportunity’s solar panels. The other participants in today's briefing are Lori Glaze, acting director of NASA’s Planetary Science Division; mission project scientist Matt Golombek; deputy project scientist Abigail Fraeman; Michael Watkins, head of NASA’s Jet Propulsion Laboratory in Pasadena, California (which manages Opportunity’s mission); and Jennifer Trosper, project systems engineer for Mars 2020, NASA’s next Red Planet rover mission. 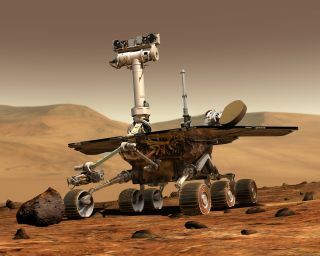 Visit Space.com at 2 p.m. EST (1900 GMT) for complete coverage of NASA's Opportunity Mars rover announcement. Editor's note: This story was updated on Feb. 13, 2019.